I met Keith Strandberg and Shawn Flanagan at the Michael DePasquale Jr. Living Legends Celebrity Roast in Atlantic City New Jersey where they were guest speakers. Together they bring a wealth of knowledge for this product for Black Belts only product . Any watch purchase though the Museum of Sport Karate, a portion will be given to advance the Museum and help build a bigger facility and to keep the on-line Museum accurate. please mention the Museum of Sport Karate for us to received our credit on your purchase. 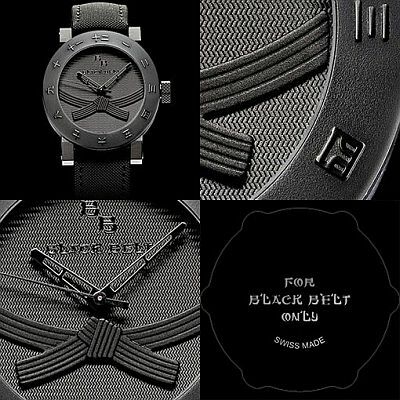 Who is Behind Black Belt Watch Distribution USA? Keith W. Strandberg is a black belt in Isshinryu Karate and an award-winning writer/producer of martial arts feature films (including “No Retreat No Surrender,” “The King of the Kickboxers,” “American Shaolin,” “SuperFights” and more. As a freelance writer, Strandberg has written for Black Belt magazine, Karate Illustrated and many more. In addition, Strandberg is a well respected watch journalist who lives in Switzerland. He speaks fluent Chinese, French and a smattering of German. Shawn P. Flanagan is a black belt in Kenpo Karate and Yoshitsune Jujutsu. He is an entrepreneurial minded business person with over twenty years experience in both B2B and B2C sales and sales management. He opened his first dojo in 1987 and was instrumental in the growth and development of the business to include 12 locations in the New England Area. After successfully managing the organization for ten years he sold his interest and moved on to other ventures. A mentor, coach and leader he is well respected in his field and has developed and consulted martial arts school owners in areas of effective business development practices and dojo management. Shawn is currently finishing an MBA program at Babson College in Wellesley, MA. US News & World Report has ranked Babson’s MBA program #1 in entrepreneurship for 17 consecutive years. Shawn continues to teach and train in the martial arts. His Dojo, Karate International Martial Arts Center, is located in Exeter, NH. Strandberg and Flanagan met when Shawn worked as a stunt fighter and actor in martial arts and action feature films. Some of his film credits include, “Bloodmoon”, “The Cutoff”, and “Point Doom”.